J.P.E. Hartmann (1805-1900) was a central figure in the Danish music of the nineteenth century. He composed in all genres and his music spans three cultural epochs. It was however in Danish National Romanticism that J.P.E. Hartmann achieved his most striking compositional results and the choral work Vølvens Spådom (Prophecy of the Seeress) is one of his undisputed masterpieces. The work is typified by Hartmann's special Nordic tone\ which, down to our own time, has remained part of the great legacy of Danish music. In 2006 Vølvens Spådom was chosen as one of the 12 works that represent the Danish Cultural Canon. I Moderato 4:46 6,40 kr. II Allegro moderato 2:55 6,40 kr. III Allegro 1:40 6,40 kr. IV Marsch: Lístesso tempo 2:18 6,40 kr. V Slutningschor: Moderato 4:57 6,40 kr. Yrsa, Op. 78 (1881) 7:21 9,60 kr. Axel og Valborg, Op. 57 (1857) 14:34 12,80 kr. Hakon Jarl, Op. 40 (1844) 9:19 9,60 kr. Corregio, Op. 59 (1860) 13:47 12,80 kr. The life of J.P.E. Hartmann extended over most of the nineteenth century. When he was born, on 14th May 1805, Napoleon had been Emperor of France for just over five months, and in his old age Hartmann could still remember certain experiences during the bombardment of Copenhagen in 1807. When he died in March 1900 the British were fighting the Boer War in South Africa, Copenhagen had grown to four times its size, electric trams were running in the streets, "old Hartmann", as he was called, could phone his children and grandchildren, and the first gramophones had appeared in the shops. In 1805, Haydn was still alive, although he had concluded his life's work with the great Theresienmesse three years earlier, and Beethoven was working on his only opera, Fidelio. Composers like Mendelssohn, Schumann and Chopin were younger than Hartmann, and yet he survived all three by about half a century. In 1900 Gustav Mahler completed his Fourth Sympbony, Arnold Schoenberg had already put the finishing touches to the string sextet Verklärte Nacht the previous year, and in St. Petersburg sat the 18-year old law student lgor Stravinsky gaining his first experience as a composer. Hartmann was the third generation of a family of musicians. His grandfather, Johann Hartmann (1726-1793) had in the 1760s come to Copenhagen, where he became a member of the Royal Orchestra and made his mark in Danish music with the two Singspiele -Balders død and Fiskerne with texts by Johannes Ewald; and his father, -August Wilhelm Hartmann (1775-1850) was for many years a violinist in the Royal Orchestra before becoming organist at the church Garnisons Kirke. -August Wilhelm had seen too much of the difficulties of life as a musician to wish the same fate on his only child, so he insisted that his son must have a good academic education. Hartmann was therefore sent to the school Borgerdydskolen - the same school where the brothers Peter and Soren Kierkegaard were pupils - and after leaving school he finished his education by taking a degree in law. This opened doors to a career as a civil servant, and Hartmann was fortunate enough to get a job as a secretary at the office of the Registrar General, for without a good regular income he would have been unable to marry the bride of his choice, the rich commissioner Zinn's daughter Emma, a talented woman who herself had an artistic streak and composed romances which were published in the 1840s under the name Frederik Palmer. But although Hartmann never had any formal training in music, it became his career alongside his civil service job. As early as at the age of 19 he had succeeded his father as organist at Garnisons Kirke, a post he kept until 1843, when he went to Copenhagen -Cathedral as Weyse's successor, and thus came to work as an organist for no less than 76 years! And in 1827, when the Italian singing-master Giuseppe Siboni opened his Academy of Music, the 22-year old Hartmann was employed as a teacher of piano, harmony and singing. So even at a young age he was a figure to be reckoned with in Copenhagen musical life; and as the years passed he was to assume a unique position. In 1836 Hartmann was one of the co-founders of the concert society Musikforeningen, and he remained a member of its board for the rest of his life. Although from the middle of the century it was primarily his son-in- law Niels W. Gade who was to leave his mark on the society as its conductor. And from its founding in 1839 until his death he was also involved in the student choral society Studentersangforeningen, which was very influential in the nineteenth century; he was active as Chairman to the end and idolized by the students. Then when the Copenhagen Academy of Music was established in 1867 it was a matter of course that the founder appointed Hartmann, Gade and H.S. Paulli as its leaders. Thus for many decades Hartmann held the central posts in Danish musical life, while still keeping up his civil service secretarial post (until 1870), his work as an organist, and his composing career. As a composer Hartmann was on the whole self-taught, but since he had grown up in a family of musicians he had been given the opportunity since childhood to hear many different kinds of music in the orchestra pit of the Royal Theatre, at Garnisons Kirke and at the chamber music gatherings held in his parents' home. In 1836 he went with Heinrich Marschner, who had visited Copenhagen to conduct his opera Hans -Heiling, to Germany to begin an extended tour abroad during which, among other things, he made the personal acquaintance of Chopin, Rossini, Cherubini and especially Louis Spohr, with whom he formed a warm friendship. Other journeys abroad followed in the 1840s, when he conducted his Hakon Jarl overture at the famous Gewandhaus in Leipzig; but although these trips gave Hartmann the opportunity to get to know the music of his European contemporaries, it had no effect worth mentioning, especially in his later years, on his own musical development, which after the German-inspired period of his youth proceeded calmly and steadily without foreign influences. Hartmann wrote several hundred works in well nigh all musical genres. In his time he was loved for his popular Danish songs like Flyv, flyv, fugl over Furesøens vove (Fly, bird, fly, over Furesøen's billow) and Storken sidder på bondens tag (See the stork on the farmer's thatch), which reflected Danish rural idyll. He also contributed several songs to Grundtvig's Folk High School movement, while also continuing Weyse's "romance" tradition with, among other things, the passionate Sulamith og Salomon songs to texts by B.S. Ingemann. Another genre that helped to make Hartmann popular in his time was the many cantatas for the great Royal events of the century: weddings, silver weddings, funerals - works which, however, because of the occasional character of the texts, are doomed to oblivion. One occasional work has however remained standing: the monumental funeral march for winds and organ written for the funeral of Thorvaldsen in 1844, but used for all Royal funerals ever since. Hartmann tried his hand at opera too, although with varying success. His debut work Ravnen (The Raven) of 1832 to a text by his contemporary and friend Hans Christian Andersen (who later took credit for "discovering" Hartmann) was in the opéra-comique style of the age, but saw only a few performances, even though Hartmann and Andersen spent a great deal of time in the 1860s reworking the opera. Korsarerne (The Corsairs) to a libretto by Henrik Hertz did little better, although Rossini himself had positive things to say about it when Hartmann showed him the score during his stay in Paris in 1836 - with the comment, however, that there were too many different motifs! His real success with opera only came with Liden Kirsten in 1846, but with its gentle Danish folk--music tone it came to function for many years as the Danish national opera, especially in the face of the wars in 1848 and 1864. Despite its distinctly Danish nature it was remarkably enough the only opera by Hartmann that was performed abroad, although Marschner had made persistent efforts to get Ravnen performed in Hanover. No less a figure than Franz Liszt, whose acquaintance Hartmann had made in Hamburg, took up Liden Kirsten in Weimar, but although Hans Christian Andersen determinedly promoted their joint work on his many journeys abroad, it only had this one performance abroad. The theatre was to assume a central position in Hartmann's oeuvre, since he wrote a good deal of incidental music as well as the music for a number of his childhood friend August Bournonville's ballets. It was here in particular that Hartmann developed the special Nordic style he had first turned to as early as 1832, when at the urging of Weyse he set music to Oehlenschläger's Guldhornene (The Golden Horns). It was a style without models, and whenever Hartmann was asked about his sources of inspiration, he would jokingly answer that it must come from God. The great mythological ballets Thryms-kviden (The Agony of Thrym), Valkyrien and Arcona, demonstrate Hartmann's ability to illustrate and shape an intense atmosphere that could be translated into dance; and it was hardly coincidental that it was he who was given the task of setting music to the burlesque second act of Bournonville's Et folkesagn (A Folk Tale), which takes place in the troll hill, while the soft Midsummer mood of the other two acts was assigned to Gade. Hartmann also made several contributions to the Danish piano literature, from genre pieces in the vein of Mendelssohn and Schumann to the weighty piano sonatas, which are among the most important in this genre written in Denmark, while his orchestral output - besides the two symphonies from 1835 and 1847/48 - centres on the overture form that preoccupied Hartmann from the time when, at the age of 20, he composed his first concert overture until, at the age of 83, he wrote the music for Chr.F. Molbech's play Dante. The medieval mythological poem Vølvens spådom? (The Prophecy of the Seeress) where the seeress or sibyl (the Vølve) speaks in magnificent visions of the history of the world from its creation to its end in Ragnarok and its recreation, has inspired many artists from early times until our own, when Suzanne Brøgger has retold it and Per Kirkeby has created a series of lithographs as illustrations for it. It was J.P.E. Hartmann's composer colleague Peter Heise who drew attention to the retelling that Frederik Winkel Horn had published in 1869, and it was no coincidence that he did so, for Hartmann had already dealt with related subjects in his collaboration with August Bournonville on the great mythological ballets Valkyrien and Thryms-kviden. And Hartmann quickly embarked on the task of setting music to a selection of the 70 strophes of which the poem consists, for the first sketches are dated 19th April 1870, and two years later the work was finished, so it could be given its first performance in the spring of 1872 in a collaboration between the Copenhagen and Lund Student Singers' Societies in their respective cities. During the last 30 years of Hartmann's long life, it became his most frequently performed work, and in fact it proved the culmination of the Nordic style that Hartmann had developed over forty years, from The Golden Horns through the instrumental works like Slaget ved Stiklestad (The Battle of Stiklestad), the music to Oehlenschläger's Olaf den Hellige (Saint Olaf), the overture to Hakon Jarl and the above-mentioned mythological ballets - until the ancient Icelandic poem finally put words to Hartmann's musical visions. Although Vølvens spådom was performed frequently in Denmark as well as both Norway and Sweden, the work appears to have reached beyond the Nordic countries only once: this was in 1893, when Edvard Grieg, a great admirer of Hartmann, ensured that it was performed in Leipzig at a grand concert for an audience of almost 3000 people. Grieg took the view that the performance far outshone what he had heard in Denmark, but was slightly offended that a critic had alleged that he had heard reminiscences of Wagner. To this Hartmann replied drily: "Vølven was composed more than 20 years ago - that is, at a time when those works by Wagner which, in subject, might be recalled, perhaps did not exist, far less were known to me or anyone here." Vølvens spådom is divided into five movements, and here Hartmann has followed Winkel Horn's division of the strophes into groups of 2+3+2+1+1. The instrumental introduction is kept in a mysterious piano, a sombre mood that has great similarities to the depiction of winter in Spring Song. The basses rise up almost imperceptibly from the depths, where Odin's eye is hidden. All four voices come in sotto voce with the same theme and grow to a forte where the morning sun shines over the land in a brilliant E major as a contrast to the minor tones of the introduction. The theme also changes to minor where the seeress speaks of Mimer, who drinks mead from the pledge that Odin gave him. The second verse is a note-for-note repetition of the first half, but the middle section is omitted, since the verses are not equally long. The second movement is about the slaying of Guldveig, who lived even after she had been burnt three times. It begins with a march theme in the strings, underscored by mighty struck chords on the unstressed bar beats, and powerful, marked chords prepare the way for the chorus, which is characteristic in its persistent triplet motion in 2/4 time and an almost constant forte at an exposed pitch for the tenors. The lines that constantly recur through the poem - "Then went all the powers to the high seats" - which form the central axis in this movement, are emphasized by short but effective crescendi to a forte on the words magter (powers) and stole (seats). Here the gods decide on whether "the high Ases should suffer the consequences, or all gods should pay the price", and when Odin throws his spear, the wall that has been around Asgård falls - war has broken out. On the words "now the wall was broken" Hartmann resumes the same melodic material as in the second strophe, and the movement ends in an intense fortissimo, which depicts "the Vanir who went forth". The third movement consists of two strophes, the first of which once more begins with the words "Then went all the powers to the high seats", but this time the matter at hand is the abduction of Freya, and Thor, who sets her free. A fortissimo with blaring trumpets grandly announces the meeting of the mighty, while the voices drop to piano sotto voce, where they sing of the lie that has polluted the air. In supple, dotted rhythms they sing of Thor's wrath over breach of promise and deceit, and as his ire increases, the music too swells in a fiery crescendo with sforzandi and rushing triplets in the orchestra. A tremolo in the low strings announces a march with a characteristic motif in thirds, forming the transition to the fourth movement, which follows attacca. The introduction is a continuation of the march, but now based on a fourth and with a distinctive rhythm, inasmuch as the four crotchets are tied together two-and-two with marcato on the stressed ones and staccato on the unstressed. It is a minor version of the march that depicts the gods gathering for the last battle in the ballet The Agony of -Thrym. Before the voices enter, the third--motif appears again, while the song of the chorus about the Valkyries assembling to ride to the land of the gods is again in fourths. In a number of hammering diminished seventh chords, we hear of all those who accompanied them, but the fourth--motif gradually takes over and the movement ends in a veritable Ride of the Valkyries. Here Hartmann skips all the next strophes and goes straight to the vision of the coming of "the Strong One" after all the good have gathered in Gimle. After the violent discharges of energy in the preceding movements the end, which begins with a series of arpeggiated harp chords, has the effect of an apotheosis with its calmly borne-up dolce melody in A major. Only when the subject is the great judgement does the music move up into forte and fortissimo; otherwise it stays in piano and ends in a serene pianissimo. In 2006 Vølvens spådom was chosen as one of the twelve musical works in the Ministry of Culture's Danish Cultural Canon. Hartmann worked with most of the great Danish poets of the Golden Age. At the -human level he was closest to Hans -Christian Andersen, but as a source of inspiration no one could match Adam Oehlen-schläger; his great tragedies in particular helped Hartmann to create his special -Nordic style. The collaboration already began when Hartmann was just 20 and a fledgeling organist at the church Garnisons Kirke. For a concert in support of the restoration of the organ Oehlenschläger had supplied the text of a cantata with the apt title Orgelets pris (In Praise of the Organ), which Hartmann set to music. The poem is not one of the Golden Age poet's masterpieces, and the cantata saw only the one performance. It was quite a different matter when the actor N.P. Nielsen, who was to become a good friend of Hartmann's, wanted to recite Oehlen-schläger's Guldhornene at his colleague Carl Winsløw's evening entertainment at the Royal Theatre on 19th February 1832 and would not be content with words alone. He wanted background music; in other words Guldhornene was literally to be turned into a melodrama. This special genre, where a text is recited either with musical accompaniment or in the pauses between the atmospheric musical pieces, had by then existed for about three-quarters of a century as an element in operas. The best known examples are the prison scene in Beethoven's Fidelio and the Wolf Gorge scene in Weber's Der Freischütz, both of which had been played at the Royal Theatre. Among Danish composers Kuhlau had tried it just once - in the "Mother Karen" scene in Act One of Elver-høj. But there was also a special sub-genre called the concert melodrama, which Weber among others had cultivated, and it was this form that became the model. N.P. Nielsen had at first gone to Weyse, who had not warmed to the idea and had referred him instead to his young protegé Hartmann, with the remark that with that commission he would be "walking right into Hartmann's parlour". Exactly what Weyse meant by the comment is hard to say, since Hartmann had not yet produced anything that even pointed in the direction of the special Nordic style that was later to become his hallmark; but it may be that Weyse thought that the first flowering of Romanticism in Danish poetry would be an apt source of inspiration for a composer who was at that time putting the finishing touches to his first major Romantic opera. At all events, Hartmann took on the job and accomplished it with bravura. Around 1840 Hartmann was commissioned to write music for no fewer than three of Oehlenschläger's plays. First the tragedy Olaf den Hellige (Saint Olaf), which had some success in 1838 - not because of Oehlenschläger's text, but thanks to Hartmann's and Bournonville's magnificent version of the Battle of Stiklestad. The next year saw another tragedy, Knud den Store (King Canute), which was a failure with only three performances; and finally Oehlenschläger's dramatic poem Fiskeren (The Fisherman) was adapted in 1840 as a play in the style of Aladdin, which had been the great hit of 1839. Despite a huge effort from the -Theatre, Oehlen-schläger had no luck this time either. His poet colleague Hans -Christian Andersen had the following comment: "Oehlenschläger's Fisherman has beautiful music, lovely costumes and decor, but it all seems but a view through a kaleidoscope; one feels empty during the viewing and tired afterwards. At the third performance the theatre was very empty and a loud hissing was the result of the audience's evening entertainment." In 1844 Hartmann returned to the Oehlenschläger tragedies, but this time it was not a close collaboration with the poet on a new work, but an overture to the poet's breakthrough work Hakon Jarl hin rige, which had seen its first performance as early as 1808. Since then the tragedy had been shown around thirty times, but it was not until 9th April 1844 that music was linked with the performances. Whether Hartmann wrote his overture all on his own initiative or was asked to write it, we do not know, but it was at any rate no ordinary repertoire item on 9th April 1844, when the overture was played for the first time. On 23rd March the great Danish sculptor Thorvaldsen had suddenly died in his regular seat in the stalls at the Royal Theatre - a beautiful death, Hans Christian Andersen called it - and it tells us something about the position of Hakon Jarl - and Oehlenschläger - in Danish theatrical life, that the choice fell on this particular tragedy when the Theatre wanted to pay tribute to the great sculptor. That the overture was not written especially for this memorial performance is as evident as one could wish from Hartmann's autograph score, for he noted in the top corner that he began the work on 7th March 1844. On the other hand, he presumably worked hard to get it finished in time, for the overture is end-dated 6th April 1844, that is just three days before it was to be performed - something of a tour de force when one considers that in the same month he also managed to compose another of his major works, the funeral march for Thorvaldsen's burial service in Copenhagen Cathedral on 30th March, and a song for the same occasion. Hans Christian Andersen wrote of the memorial performance: "Thorvaldsen's seat in the stalls, which since his death has been closed off, stood wreathed with laurels and long mourning crape; then they played -Hakon Jarl, for which Hartmann has composed a new overture - expressing the battle of Christianity against Heathendom." This interpretation of the musical content of the overture is quite in keeping with the title page of a later transcription which bears the following programme note: "Hakon Jarl. Overture. Dedicated to Adam Oehlenschläger. The struggle of Heathendom in Norway against Christianity and the victory of the latter under Olaf Trygvason." This programme was not found with Hartmann's autograph, but as long as the overture was performed together with the tragedy, its content was self-evident; it was only when it took on independent life as a kind of symphonic poem that a more specific explanation was necessary. To underscore the dark atmosphere that typifies much of the overture, Hartmann used a strong brass section of two trumpets, four horns, three trombones and a tuba, and chose the main key of C minor. Formally, the overture is built like many other Romantic overtures with an introduction and a main body in sonata form, but with a coda instead of a recapitulation. The introduction with its tempo instruction Allegro ma non troppo serves to present four themes. The first is a dark, rhythmically charged motif pianissimo in the low strings and the bassoons. The late Hartmann expert Sven Lunn proposed the theory that Hartmann may have been inspired to write this introduction by Oehlenschäger's poem Hakon Jarls død (The Death of Hakon Jarl), which begins "The nights so long and brooding ..." , and the initial bars could well suggest this. They are followed by a new theme, first three bars of fortissimo marcato chords and then a more fluid melody with harp accompaniment. The third motif is more cantabile in the solo clarinet and three cellos, and forms the central axis of an arched form, as both the previous motifs return in reverse order before the introduction ends with a bright A flat major motif in the flute supported by harp chords and cellos - this is Olav Trygvason's motif. The main body, as mentioned above, is in sonata form with a first subject that is related to the first theme of the introduction, but a change in the rhythm and tempo gives it a more aggressive, forward-storming character. This is Hakon Jarl's motif, while Olav Trygvason's motif in its final form, this time in the relative major key of E flat, is not surprisingly the second subject of the exposition. In the closing group the two subjects clash in a fortissimo marcato - the battle has begun. The development opens with the second theme of the introduction, taken from five bars of music played backstage at the end of Act Four, when Einar Tambe, in his anger that Hakon has sacrificed his little son Erling to Odin, rejects Hakon. The stage directions mention the ancient lur horns and trumpets, but besides the large muster of winds, Hartmann also adds a gong to emphasize the -heathen element. This is the turning-point of the overture. After both first and second subject have been developed in many sound-visions, the Hakon Jarl theme disappears in a diminuendo where the theme is inverted, i.e. is in descending motion instead of the storming ascending motion of before. Originally the overture ended with a coda that treated both themes contrapuntally - that is, with no definitive ending - but later Hartmann wrote a new coda in C major which is entirely in the nature of an apotheosis of the victor Olav Trygvason, i.e. Christianity. With the Hakon Jarl overture Hartmann consolidated the Nordic sound he had begun in Guldhornene and continued in the music for Olaf den Hellige. The pairing of the gloomy minor motifs with the dark instrumentation with the many brasses was for the Danes of the Golden Age the epitome of the sound of the remote past. It has been said that precisely this distinctively Nordic character prevented its spread abroad, but Hartmann very successfully conducted the overture at a Gewandhaus concert in Leipzig in October 1844, and in 1876 the then conductor of the Gewandhaus concerts, Carl Reissiger, also conducted the overture with success. The Hakon Jarl overture was the last Oehlen-schläger work to inspire Hartmann while the poet was still alive. Only when the tragedy once more appeared on the bill in 1857 did Hartmann expand his Hakon Jarl music with the entr'acte music. At about the same time Hartmann had also been inspired to write an overture for Oehlenschläger's Axel og Valborg, which had been premiered as long before as 1810. In the 1855/56 season the tragedy had again been put on the programme, so although Axel og Valborg had been revived several times, it must be considered likely that it was these performances that inspired Hartmann to write his great overture, which in view of its length must rather be considered a symphonic poem. The overture is enddated 7th January 1857, and by then Axel og Valborg had again been taken off the bill, so that it could not be used until four years later, which also suggests that Hartmann had really intended it more for concert use, as is indeed what happened, since it was played by the concert society Musikforeningen just thirteen days after he had completed the score. In his classical five-act tragedy Oehlenschläger tells the story of Axel, who - like Sverkel in Liden Kirsten - returns to his childhood sweetheart from his service with the Emperor in Myklagård (Constantinople). Valborg has waited for him with longing, but the King of Norway, Hakon Herdebred, has fallen in love with her, and has induced the Dominican Friar Knud to separate the -couple by saying that they cannot marry because they were baptized together. When the King is attacked by Erling Skakke, Axel decides despite everything to support his King and former friend, but when he plunges into battle to take the place of the wounded King, he is killed. Before he dies he has time to take moving leave of King Hakon and his beloved Valborg, who dies of grief, like Wagner's Isolde seven years later. 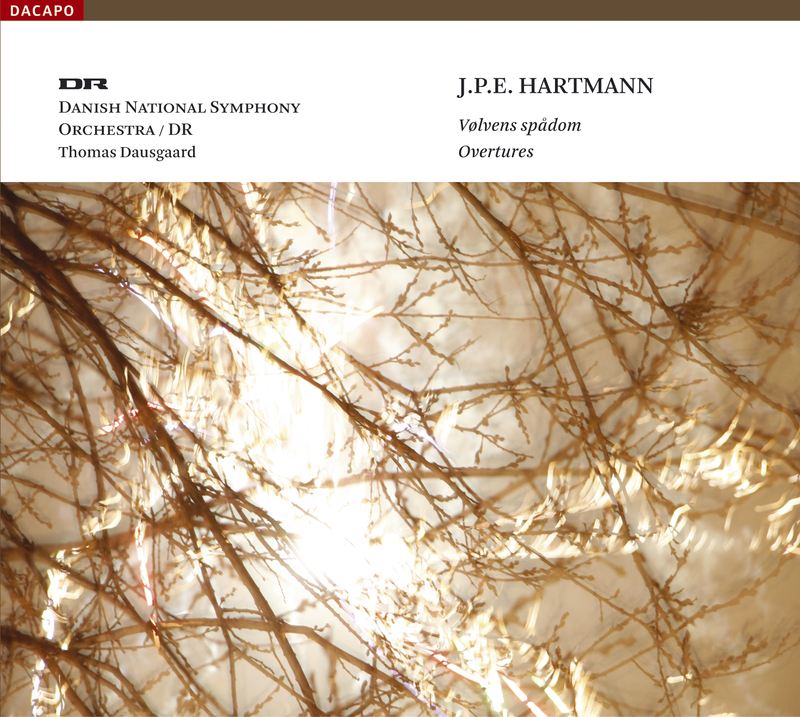 Hartmann built up his overture over Weyse's "romance" based on the -ballad of Aage og Else, from which he quotes fragments in the slow introduction and in its entirety at the end, when Axel's friend Vilhelm sings it for Valborg. The slow introduction strikes up the melancholy mood, thus anticipating the tragic end. The main body is based on two subjects: the masculine, upward-soaring first subject and the gentle, melancholy second subject, which can be seen as a symbol of the two lovers. As the overture develops, the tensions are intensified dynamically and harmonically and culminate in Axel's fight, which ends abruptly when he falls. The music suddenly falls calm, and this is followed by Weyse's romance in a beautiful setting as the most moving part of the overture; but before the music fades out entirely, one hears a faint echo of the themes of the two main characters that recalls their sad fate. As early as eighteen months after Hartmann had finished the score for Axel og Valborg, he put the final touches to another Oehlenschläger overture, Correggio, which was again a tragedy from the beginning of the century, when Friedrich Kunzen had been responsible for the music. Oehlenschläger had originally written the tragedy in German because he thought the subject was not Danish, but European; but one is tempted to say that it is universal, for Correggio is about the renaissance painter Antonio Allegri, who paints quite unreflectingly in his native Correggio (he called himself Correggio) until he is visited by Michelangelo and Giulio Romano, who criticize his work. This prompts him to self-scrutiny, but when he is in Parma to sell a picture to the nobleman Ottavio, who is trying to win the art-loving Coelestina by owning an outstanding collection of paintings, Antonio makes the acquaintance of great art which gives him a yardstick to work from. Coelestina is captivated by his picture and places a laurel wreath on his head, and he is paid a bag of money for his work. Unfortunately this bag is so heavy that the effort drains the last of his energy, and he dies on returning home, just as he receives an invitation to take up a position at the court in Parma. In this case too, Hartmann does not seem to have written his overture for use at the Royal Theatre, although the play was constantly in the repertoire of the Theatre; at any rate it was not used in his own lifetime, and outside the Theatre eighteen months passed before Gade "baptized" it at a concert in Musikforeningen on 19th December 1860. For the occasion Hartmann had for once said a little in the concert programme about the content of the overture, which is the essence of Oehlenschläger's tragedy: "The introduction depicts Correggio's romantically melancholy mood, interrupted by a revelation of the sacred ideals of his art; the Allegro is the hopes of his life, now darkened by despondency, now enlivened by new inner revelations; the end is the death of Correggio and the future greatness of his name." This means, then, that the central aspect of the overture is not the action of the tragedy, as in Axel og Valborg, but the changing moods of the main character. -Consequently, the music too is very mutable with frequent changes in tempo: Mode-rato non troppo for the melancholy introduction which is in F minor, but changes to con anima and F major at the revelation; Allegro con anima for the light staccato theme that evokes his hopes, but with elements of poco più moderato when the despondency takes hold. The final part of the overture has the character of an apotheosis. Motivically, the music concentrates on the opening theme, which falls into two bars with a characteristic syncopated rhythm and the lamenting triplet figures of the next four bars. It is the syncopated figure that develops into the triumphant major-key theme that symbolizes the sacred ideals of art that triumph in the end. A whole 23 years were to pass before Hartmann both crowned and ended his Oehlenschläger visions with the magnificent overture for Yrsa. In the summer of 1813 Oehlenschläger had written the two poetic romance cycles Frodes drapa and Helges eventyr, ending with the tragedy Yrsa, the action of which is the culmination of the two poems on the legendary kings Hroar and Helge. In Yrsa Helge has returned to the treacherous Queen Oluf of "SaxIand", whom he once loved and cannot forget, although she has humiliated him. He meets the beautiful young fisherman's daughter Yrsa, whom he marries, but after the wedding Queen Oluf tells him that it is in reality their own daughter he has married. This is her revenge. Helge takes his own life, and Yrsa wants to follow him, but as she raises the dagger to stab herself in the breast she is stopped by the goddess Freia. On Helge's ship Yrsa sails to Hroar's city (i.e. present-day Roskilde) to give birth to Rolf Krake, who will become King of Denmark. The tragedy had never been performed when the Royal Theatre decided to put it on the bill in 1880 - thirty years after Oehlen-schläger's death. This was presumably because one has to know the story of the two preceding poem cycles to understand the action of the tragedy. Hartmann was asked to write the music, and as early as September 1881 he had a large score ready, which besides the overture also included a number of large and small orchestral pieces, as well as melodramas and choruses. However, some time passed before the premiere came on Hartmann's 78th birthday in 1883. The overture to Yrsa - like almost all Hartmann's overtures - has a brief, slow introduction piano, establishing the mood, but is otherwise based on two contrasting themes: the masculine "Viking-like" subject which is taken from the music for Helge's landing in Saxony, and the gentle, cantabile second subject with harp accompaniment, which is also used in the tragedy for Yrsa's meeting with Freia. There is both enough contrast and enough unity between these themes for them to be used for contrapuntal treatment, which ends with a kind of vision where Yrsa's theme in the high strings with harp accompaniment symbolizes Denmark's future greatness under Rolf Krake. These bars were also to mark the end of Hartmann's fifty years of working with Oehlenschläger's poetry. Vølvens spådom has been recorded in the Danish Radio Concert Hall on 31 August - 1 September 2006. Published by Niels Krabbe, J.P.E. Hartmann: Udvalgte Værker, Serie V, Bind 1. Det Kongelige Bibliotek,2006, www.kb.dk. Overtures has been recorded in the Danish Radio Concert Hall in May 1998. Dacapo acknowledges, with gratitude, the financial support of Weyse Fonden. This CD has been made in cooperation with the Danish Broadcasting Cooperation.